The mass per metre of the string (also known as ‘mass per unit length’). This animation shows an impulse travelling along a string. When it meets a fixed point at the end (the metal block at the right) it is reflected back. Note, the wave flips when it reflects, it moves to the right as a hump, but to the left as a dip. The end of the string has been fixed – using a large metal block – to ensure a reflection of the wave when it meets this boundary. In the animation, there is a (crude!) attempt to show that when the wave is reflected, there is a phase change – if the displacement of the string is in an upwards direction for the wave travelling left-to-right, then the reflected wave going from right-to-left will be displaced in a downwards direction. Compare the amplitude of the reflected wave and the incident wave – what does this tell you about the presence or absence of damping at the point of reflection? The damping causes the wave to get smaller as vibration energy turns to heat. You can see this animation happening for real in this slow motion video of a transverse wave travelling along a bungee cord. Or if you prefer to see a real instrument, the video below that, is high speed footage of a guitar sting being plucked. The string alone doesn’t create much audible sound, so the vibration has to be amplified. This could be done electronically, via a pick-up, amplifier and loudspeaker, as is done with an electric guitar. Alternatively, acoustic instruments use the vibration of thin pieces of wood. For a guitar, the top wood plate vibrates, for example. The video below shows how a violin body vibrates as it amplifies sound. The mode shapes are different at different frequencies. Tea leaves have been sprinkled onto the plate, and these move to where the wood isn’t moving, and therefore shows the pretty vibration patterns. The vibrating string examples show what happens when a string is set into its free motion by an impulse – by being plucked. What happens if we force a string to vibrate using some kind of continuous input. The video shows what happens with a violin string being bowed. Towards the end of the video, the string is moving like a skipping rope! What is going on? First think about putting just one sine-wave into one end of the string, and allowing it to travel towards the reflecting boundary. The composite waveform is known as a standing wave. It differs from a travelling wave (transverse or longitudinal) since the pattern oscillates, but appears to be stationary – there is no apparent right to left (or left to right) movement of energy. Every standing wave has nodes (locations of minimum amplitude) and anti-nodes (locations of maximum amplitude). In the animation, the nodes are the points on the string that aren’t moving up and down, and the anti-nodes the points where the string moves up and down the most. The movie below shows the vibration of the string at the lowest standing wave mode, along with a graph of the amplitude verses frequency. We’ll call this frequency which drives the lowest standing wave the fundamental frequency, F(Hz). This is actually similar to our kid-on-a-swing examples. The wave travels left-to-right, is reflected and travels right-to-left arriving back at the shaker at just the right time to get another push. In other words, the interference between the reflected wave and the next wave driven by the shaker, is constructive. We know the period of vibration of the string driven at its fundamental frequency will be 1/F (s). Therefore, we know that it takes exactly 1/F seconds for a wave to travel left-to-right, and be reflected and travel back right-to-left before meeting the next vibration of the shaker at exactly the right point in phase (or time). The same rules apply if the string is vibrated 3, 4, 5 etc times as fast, as the fundamental case. Because the standing waves occur at integer (whole-number) multiples of the fundamental frequency, they are sometimes called harmonics. Here the string is vibrating at three times the fundamental frequency (3F Hz). There is only one string and so these various standing wave patterns add-up by superposition and create a total waveform. 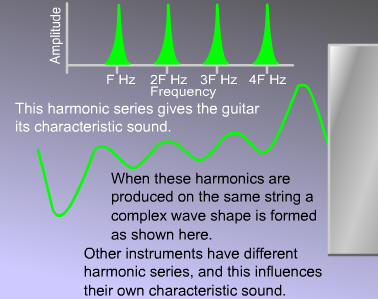 The resulting combination of standing waves contains frequency components at F, 2F, 3F, 4F (Hz) etc – and this harmonic series determines the timbre of the instrument. The timbre can be changed by bowing or plucking at a different location. Try a guitar string in the centre (lots of fundamental) and near the bridge (lots of high-order harmonics). This slow-motion video starts with someone plucking a number of guitar strings. You can actually see that they have different fundamental frequencies, which are set by the speed at which the wave travels along each string and their length. Remember – wave speed is fixed by tension and mass per unit length, which will be different for each string. Harmonics are very good news musically, because the ear likes to construct pleasant-sounding tones from harmonic acoustic oscillations. Some instruments do not produce harmonic standing wave vibrations – bells are a good example – and this makes them rather odd to listen to from a musical point of view.